Please feel free to post here pictures and information about grade 417. They are quite uncommon to find and other than the directors grade 12 size, it is the most scarce. With only 500 serial numbers blocked out for production, they are as scarce as a Polaris by the numbers. Being a 17j model and only a 12 size, they aren't near as desirable. I do know not all 500 were made into carry watches. 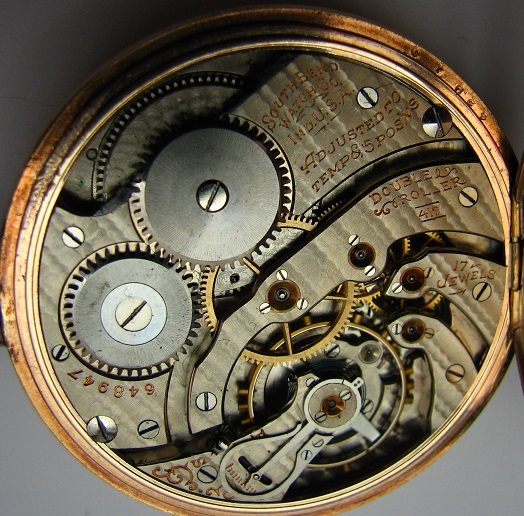 My father owns a "Studebaker" display watch, which is basically a case, with a beautiful studebaker dial with hands locked into an unfinished watch frame to hold it all together. this was put into a south bend felt lined box and only used as a store display. The watch frame of his is an unfinished frame from the middle of the 417 run. How many were never finished? I can't say, but it would not surprise me if it was 100-200 of them or even more. This grade was quickly replaced with the other grades South Bend came out shortly after the 417 grade serial numbers were allotted. It is also one I have missing from my collection. They don't come up very often and typically when they do, they are in poor shape... The last couple nice examples I know of to sell brought in the $400 range. Pretty darn good for a 17j 12 size in a gold filled case! 648610 - posted by Robert Schussel, "in a SB Pilgrim 25 yr case with a SB metal dial. 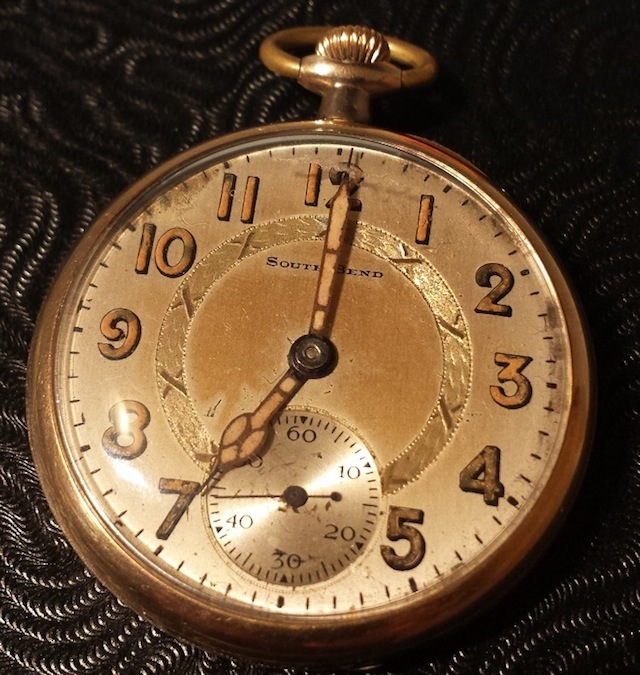 If the dial is original to the watch it is a very early South Bend metal dial." please let me know any serials you have encountered so we could fill the gaps and I will add it to this list.